Rob Engstrom of the U.S. Chamber of Commerce with Joni Ernst. The U.S. Chamber of Commerce has endorsed Republican Joni Ernst in Iowa’s U.S. Senate race. Rob Engstrom, the group’s national political director, said today they’re “all in” for Ernst because her opponent is “actively hostile” toward businesses. 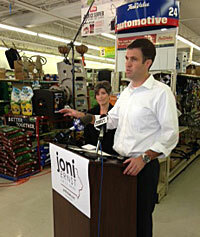 Engstrom spoke during an event at an Indianola hardware store, praising Ernst as an advocate of the free enterprise system, but directing most of his remarks at Braley. “Whether it’s chasing chickens around his neighbor’s yard and threatening lawsuits, whether it’s pretending to be a farmer, there’s not enough duct tape in aisle three to fix Mr. Braley’s failed record in Washington, D.C.,” Engstrom said, as Ernst laughed. The U.S. Chambers of Commerce spent over $35 million supporting Republican candidates in 2012 and the group this year has already spent more than half a million on behalf of just one incumbent Republican senator from Mississippi. Ernst will now benefit from U.S. Chambers of Commerce campaign ads run on her behalf in Iowa. “I do truly hope to have the opportunity to fight the good fight for good, solid, pro-growth economic policies for Iowans — both employees and employers — in the United States Senate,” Ernst said at the event inside McCoy Hardware. The Koch brothers are billionaires who are expected to spend $300 million this election cycle to back conservative candidates and causes.